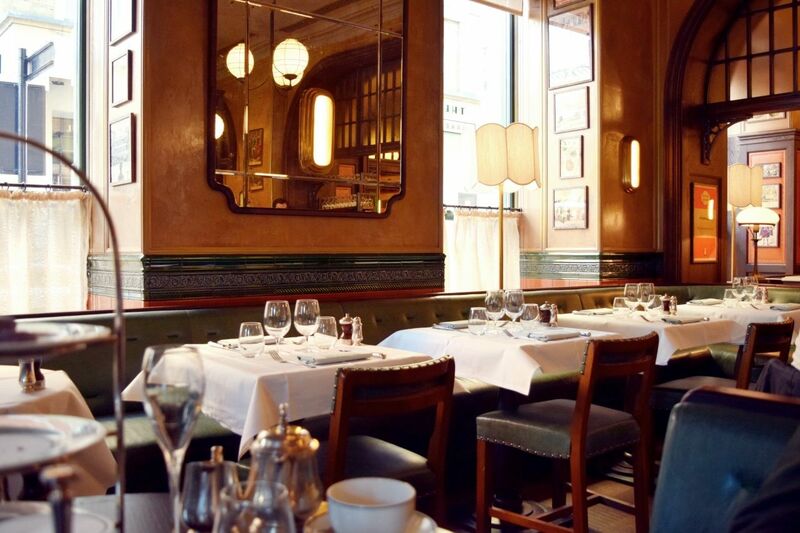 The Ivy Market Grill in Covent Garden opened at the end of last year, situated right in the heart of Covent Garden opposite the market. Not to be confused with the main ‘The Ivy’ in Covent Garden, although they are both part of Caprice Holdings. 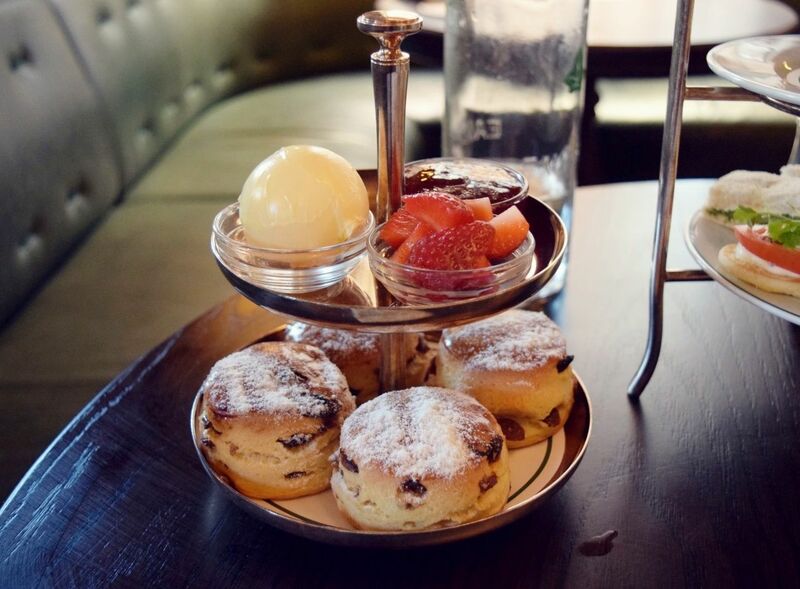 The Market Grill is an all day restaurant aimed at residents and visitors to the area to be able to drop in for breakfast, lunch, dinner and on this occasion afternoon tea. 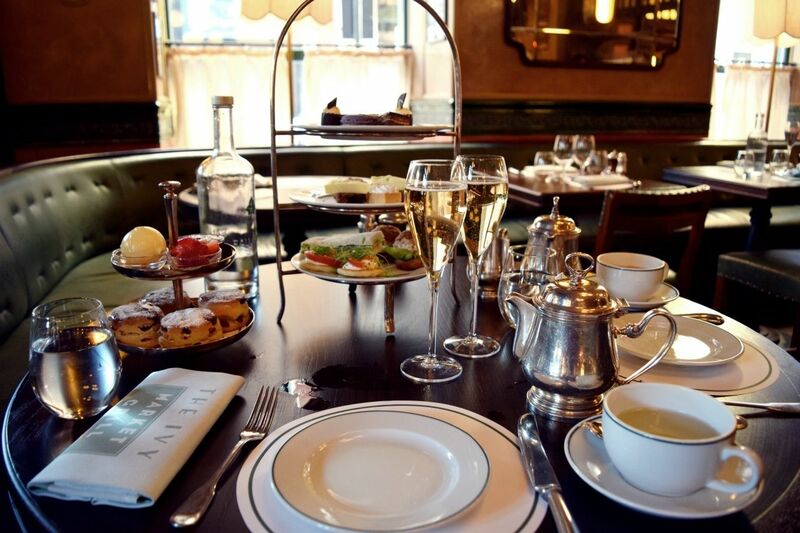 Danny and I are not unfamiliar to an afternoon tea in London and so decided to try out The Ivy Market Grill’s afternoon tea offering this week. 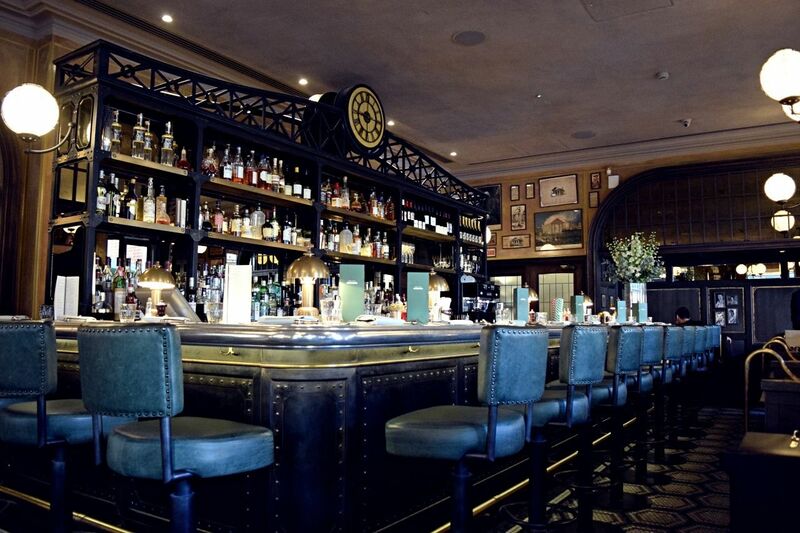 We were seated straight away in one of the leather seated booths and the bar immediately caught my eye as I loved the style of it. The interior inside has a nod to the late 19th century industrial age with mosaic floor tiles and marble tops in the cafe area. 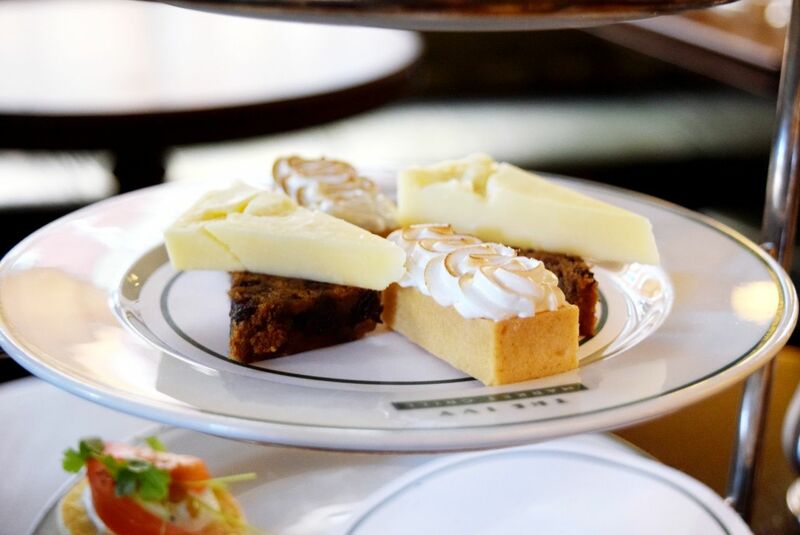 Afternoon Tea is priced at £19.50 or £27.50 for a champagne afternoon tea, which includes a glass of champagne, sandwiches, scones and plenty of cakes. 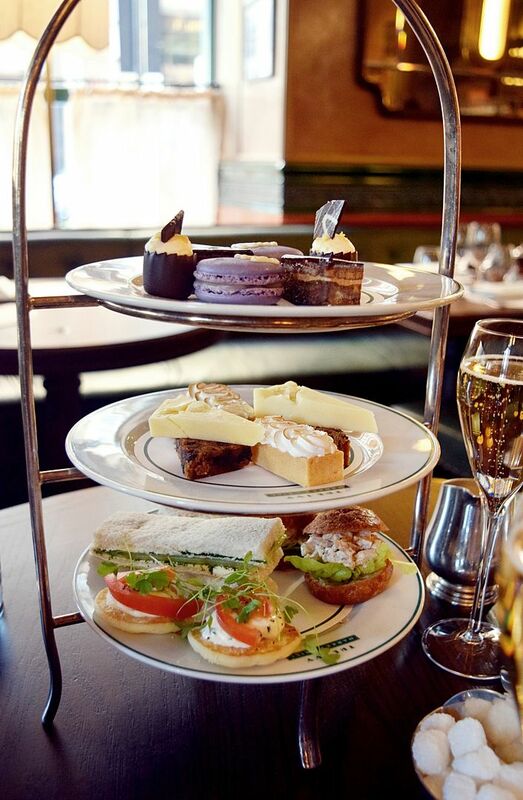 We opted for the champagne afternoon tea and we asked for no salmon as it is included on the blini which was listed amongst the sandwich selection. When it arrived there was no salmon on the blini but our waiter went through each part of the tea mentioning salmon, obviously a mistake, but a worrying one when you have an allergic boyfriend. I tried it to make sure and it was without salmon, but I was a bit disappointed as with other afternoon teas we have had, they have substituted the salmon for a few of the other sandwiches. On this occasion it was a blini with crème fraîche and a hint of tomato. That aside we delved into the sandwiches, a truffled chicken gougere and a marinated cucumber and dill sandwich, both were lovely. I had a fresh mint tea and Danny the breakfast blend, the mint tea wasn’t on the afternoon tea menu, in fact there was only two choices and when I asked about fruit tea, I got a puzzled look from the waitress. So I was disappointed there weren’t more tea selections as I love a variety of fruit teas. Onto the scones, these were my favourite part of the tea. They came out warm, all were fruit and came with jam and cream and an extra nice touch with fresh strawberries which were really lovely with the scones and also some of the cakes. The cakes included a fruit cake with cheddar, a lemon meringue pie which was definitely my favourite. 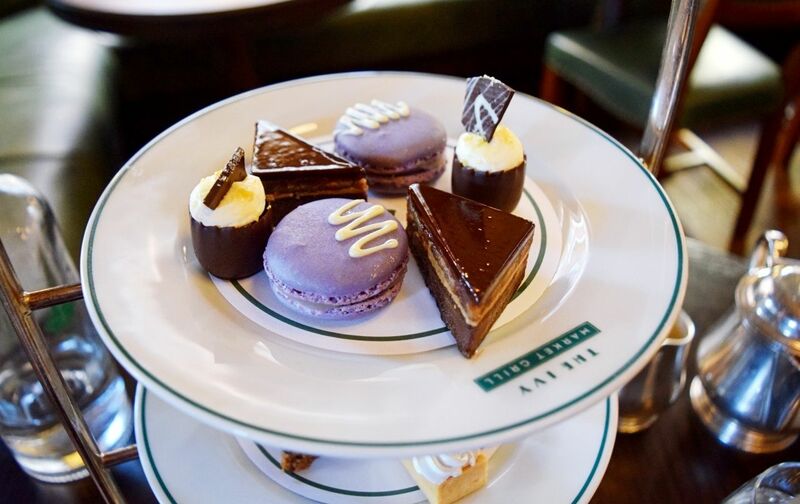 A chocolate opera cake and also a lavender and almond macaroon. I do like a macaroon but I felt the flavour was a bit intense in this, if you like lavender you will love it, but it’s not one for me. There was also another small cake, which isn’t listed but was a chocolate mousse and I think it had a cherry or orange like centre, which was really nice and great for a chocolate lover. We both enjoyed the food, but one thing we both felt The Ivy Market Grill lacked was the service. Even though this isn’t the main Ivy, being a sister restaurant and carrying the same name, it wasn’t what I expected. The staff looked pretty miserable and it’s not often I say that. 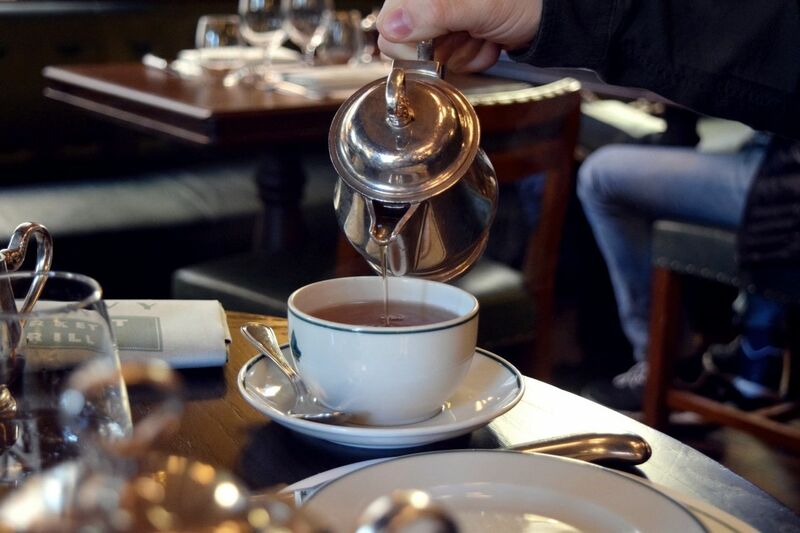 Not once were we asked if the food was ok, if we would like more water for our teas or just any sign of service like I have experienced at the Ivy restaurant on several occasions before, which is of very a high standard indeed. 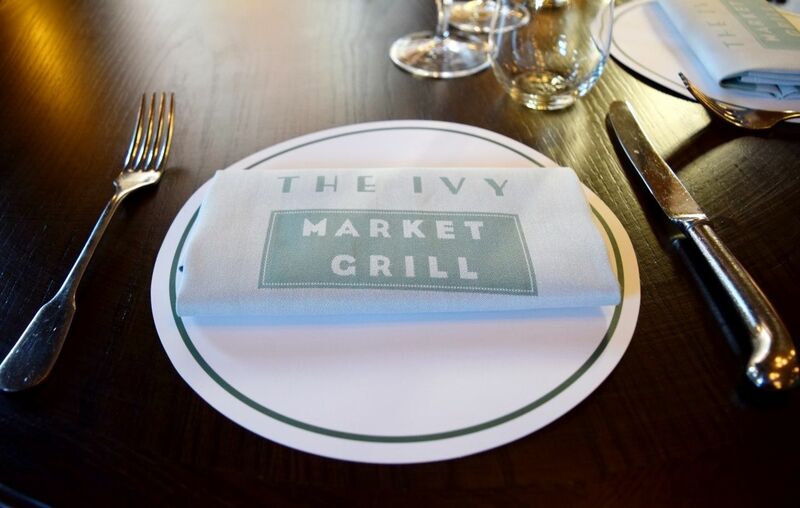 For more information on The Ivy Market Grill visit the website at www.theivymarketgrill.com. What a shame the service wasn’t great, I expected more at the Ivy. The cakes look great but it does seem a bit odd to have a chunk of cheese on top of the fruit cake?